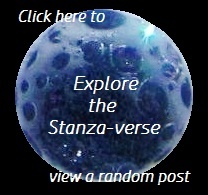 From a Different Lifetime | What Rhymes with Stanza? Today the Daily Post’s one-word prompt is Silence. I wrote a poem years ago with that title, and will share it here. The poem has a totally different voice and came from a completely (almost) different person than I am today. I am content with who I am today, and grateful for the journey that got me here. Sometimes it’s a valuable exercise to look back and be reminded from whence one evolved. Before ego there was silence. into the harsh artificial light of material world. was drowned out by a raucous cacophony. feasting at an overripe dumpster. but my goal eludes me. but ego will not go away. that sifts down through my span of consciousness. but when I fall mute, others worry. Outwardly I am judged as too quiet. Inside, ego shouts in derision. Is silence relative or absolute? Is there such a thing as too silent? We seldom understand what we hear. Why would we expect to comprehend silence? It is not essential to fill every void. Only ego thinks this way. with the still, small voice that is Silence. This entry was posted in daily prompt, humanity, poetry, serious stuff and tagged one-word prompt, poetry, silence. Bookmark the permalink. That’s an incredible way to reference the world we live in today. You get the feel of it from the first stanza alone. Foreceps pulls in with the image of biceps – a masculine egoistical image. ‘before ego there was silence’ suggests that outside of the self, nothing existed, a belief that belongs right with Solipsism – and then you complete the stanza by mentioning keywords: maker, artificial, material. Your poetry breaths with a rarity that is a quality of its own. Thank you! You make it sound like I knew what I was doing! Don’t be honest, don’t talk yourself down! And sometimes answers come so softly, we miss them through the noise.